As a builder or tradesperson, you don’t always have control over the materials you use on a project. The owner or an architect will sometimes specify the materials they want you to work with, whether you’re familiar with them or not. However, even if you didn’t specify the materials, you can be held liable for them if they are found to be defective. The Building Act 2004 sets out several implied warranty obligations on builders. These warranties apply automatically to all contracts for building work on a residential house, regardless of what the building contract says. They are designed to protect homeowners from defective building work, as well as the quality and durability of the materials. All building work is carried out in a proper and competent manner in accordance with the plans and specifications, and relevant building consent. The materials used are suitable and, unless otherwise stated in the contract, new. The building work be consistent with the Building Act and the Building Code. The building work to be carried out with reasonable care and skill, and completed within the time specified or a reasonable time if no time is stated. The home to be suitable for occupation at the end of the work. If the building work has a particular purpose to achieve, the owner must show that they have relied on the judgement of the contractor to achieve it and that the building work and materials used are fit for purpose or are of a nature and quality suitable to achieving the same result. The warranties are in place for up to 10 years and cover all work you’ve done on a project, regardless of the cost. This means that if you don’t have insurance that covers implied warranties, you could face hefty repair, replacement and labour costs. What happens if implied warranties are breached? Order you to fix the defective work. Arrange another builder to fix the work and require you to pay the costs. Take you to court and ask for compensation. BRAVEday lead insurance adviser Kane Butler says that liability policies are not designed to be warranty policies and can contain specific exclusions that drastically limit the cover. Kane says tradies should be very wary of “efficacy clauses” in their liability policies. Efficacy is an exclusion applied to some liability insurance policies in respect of failure of a product to perform its intended function. “These clauses can have dire implications and claim time and should be avoided if at all possible,” Kane says. Errors and omissions indemnity insurance covers you if you make a mistake in the course of your work and held liable for an act, error, or omission that results in financial loss to another party. 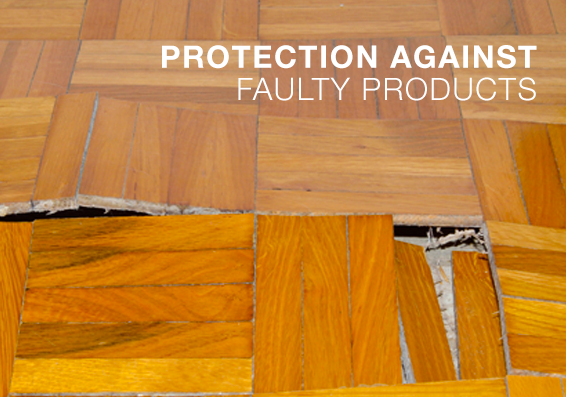 It will not protect you if the products you’ve used are defective, but it may provide cover if the financial loss is as a result of improper installation by an employee or subcontractor. Errors and omissions indemnity insurance has been standard cover for architects and engineers for many years and is becoming increasingly popular with registered builders, plumbers, electricians, and other tradies. If you have an independently-insured 10-year guarantee that covers defects in materials and workmanship, your customer may be able to make a claim under that guarantee. This will potentially void your liability under the implied warranties. A guarantee must be applied for at the beginning of each project. The best way to safeguard your trade business from implied warranty breaches is by using materials and suppliers that you know and trust. Reliable suppliers will tend to back their products and clients by providing warranties. However, these will generally be limited to the cost of materials, not the labour costs of removing defective materials and re-doing the job. If a homeowner or architect requests you to use unfamiliar products, do your research first. What is its track record? What warranties does it come with? Can you substitute it with something more reliable? If you’re not comfortable with the materials specified for a job, you should seriously consider walking away. It may not be worth the risk.